Have a read of this Daily Mail article regarding hiring a cheap and poor wedding photographer, and the reasons why you should hire a professional, even though they may be more expensive. Spread the love with a 5% discount throughout February 2018 if you book your 2018/19 wedding with me. If you would like me to record your big day, take a look at my colour or black & white wedding portfolio, then call me to book a free of charge consultation with no obligation to book. Congratulations if you got engaged on Valentines Day. Spread the love with a 5% discount throughout February 2018 if you book your 2018/19 wedding with me. Out on the road this week with a baby announcement 👶🏻, plus preparing for David’s and Denise’s Wedding 👰🏻 . Also, I have a great ❤️❤️valentines offer ❤️❤️ for you to kick off February 2018. Not long until Valentines Day, spread the love with a 5% discount throughout February 2018 if you book your 2018/19 wedding with me. Once again in this week's Bracknell Newspaper, my sport photographs is featured. If you can find my sports photographs within the Bracknell News or Weekender you will receive a 5% discount on all 2018 collections (+ 10% off January offer) when you quote the page numbers. Call me to book a free of charge consultation with no obligation to book. Click on the link below to view the all new 2018 Wedding collections. As a wedding photographer, detail photographs are a key element to the wedding day story. With time memories fade, but this photo will be cherished and tell the story in 20 years time. This is why I urge all of my clients to opt for my full day coverage. Sometime's, you will never know the true value of a moment until it becomes a memory. To book a completely free of charge consultation with no obligation to book with free tea & coffee during your consultation, get in touch now. As a wedding photographer, detail photographs are a key element to the wedding day story. With time memories fade, but this photo of Lisa’s beautiful bride bouquet will be cherished and tell the story in 20 years time. Happy Tuesday and good luck if you're getting married this week, the weather looks good in the South East of England. Tears of happiness from Laura during the unveiling of her Signature Wedding Print Presentation box. The Wedding 10x8 @loxleycolour prints are on Lustre paper, in high quality 12x10" @3xmsolution mounts. Laura's bespoke 3XM ivory coloured Signature Presentation box, contains 10 prints with an optional USB portfolio. A great addition to a wedding album. When you reserve your 2018 wedding with myself (September 2017 only), I will include a free engagement shoot, the £250 gift from me will also include one free stunning 10x8 print to cherish and admirer. My engagement shoot is designed to put couples at ease in front of the camera before their big day and it's packed full of posing tips. All new 2018 and 2019 Wedding Collections. For the whole of July, when you reserve your 2018 wedding with myself (July 2017 only), the £250 gift from me will also include one free stunning 8x10 print to cherish and admirer. My engagement shoot is designed to put couples at ease in front of the camera before their big day and it's packed full of bespoke posing tips. After the fantastic engagement last Sunday, it will be my pleasure assisting Michael Rammell - Weddings & Portraits on Saturday at Tom & Emma's wedding. From the bridal preparation until late, I will there to capture the whole day with Michael. Aaron Siskind's quote is a wonderful reminder why you should always hire a professional photographer to capture your special day. "Photography is a way of feeling, of touching, of loving. What you have caught on film is captured forever... it remembers little things, long after you have forgotten everything". Click on the link below to view the all new 2018 Wedding Collections. Limited 2017 dates available & taking 2018 bookings. It's the final day of my February huge 10% discount if you book your 2018 wedding with me. Not long until Valentines Day, spread the love with a 10% discount throughout February 2017 if you book your 2018 wedding with me. Once again a glowing testimony arrived in my in tray yesterday after working with Joesph Manns of Reading FC Women at Bisham Abbey, National Sports Centre, Buckinghamshire. 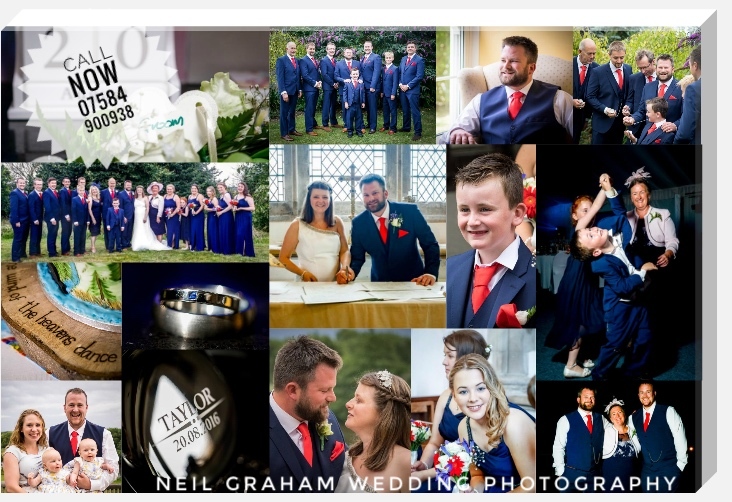 I'd recommend Neil Graham photography to anyone who wants not only a flawless photography service, but also a very personable photographer who is able to offer great suggestions of his own for your shoot. We've worked with Neil for some time now and he has always delivered high quality images and has always been reliable and a pleasure to work with. I always strive to provide the best possible service for every client and look forward to working with Joe in the future. Click on the link below to view the all new 2017 Wedding Collections. It's alway's nice to receive good feedback from clients. Its extra special when you get positive feedback from a mother of a client. I always work hard to make clients happy and strive to provide the best possible service for every customer. Customer Testimony "Neil took so many beautiful photographs at my sons wedding last summer I could not possibly choose a favourite. I spoke to Neil and he suggested choosing my favourites and I asked if he could create a canvas collage collection. He was very creative and produced a beautiful canvas for me that I am proud to hang in pride of place in my lounge! The photos chosen captured so many wonderful moments on that very special day and each person who sees it comments how great it is! My thanks to Neil for his artistic flair and professionalism"